THE SWORD Streaming New Track "Mist & Shadow"
“Mist & Shadow”, a track from THE SWORD’s upcoming High Country album, is streaming below. 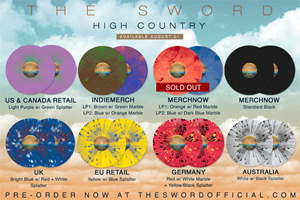 Acknowledging their fans’ undying loyalty to the vinyl format, THE SWORD has created unique colored vinyl of their new release, High Country, for different territories. Two of the vinyl are currently available for pre-order at Merchnow and Indiemerch, while the others will be available on release day August 21st. Different colors are available for the US/Canada, UK, Europe, and Australia. The band has also created a unique vinyl that will be sold through the Napalm Records website in Germany, separate from the ones available throughout Europe.